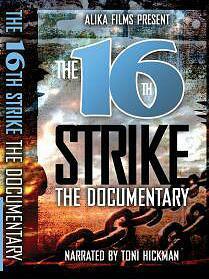 The 16th Strike documentary was created by Author and Hip-Hop Artist Alika Hickman and is titled after a poem by Author and Educator Nikala Asante. It presents solutions to common problems in the African American national community with the goals of helping us to heal and move forward as a people. We must be our own leaders and take responsibility for creating positive change in our communities. Further, although you will enjoy the spoken word, Hip-Hop, and soul music weaved throughout The 16th Strike Documentary, this film is not only for entertainment purposes. Hold a community screening. View it with your community organization, fraternity, sorority, club, church, mosque, Ile, friends, or family and create an ACTION PLAN in response to one of the issues presented. We are the ones that we have been waiting for.